The Dota 2 International 2014 grand finals are here. 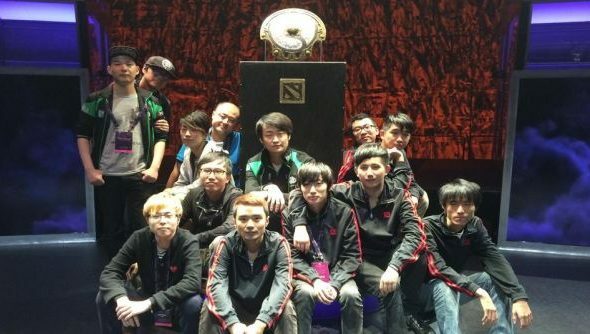 Sixteen teams have battled over the past two weeks to have a shot at the Aegis of Champions, and with it a slice of just under $11 million dollars; the winner of which will take home over $5 million. The mammoth best of five is between two Chinese teams: ViCi Gaming and NewBee. It’ll mark the first International where fan favourites Na’Vi have not made it to the finals. The broadcast is starting right now over on Twitch, and you won’t want to miss it for the world. You can watch the Dota 2 International 2014 grand finals in full via this Twitch stream. There’s a couple of other ways to watch too, and you can check them out in our ‘ways to watch section’ of our Dota 2 International preview. If you’re new to Dota 2 I’d recommend watching the Newcomers Broadcast. Who are you rooting for? I’m rather in love with ViCi’s, but both teams have done tremendously well over the last couple of days during the Dota 2 International main event.